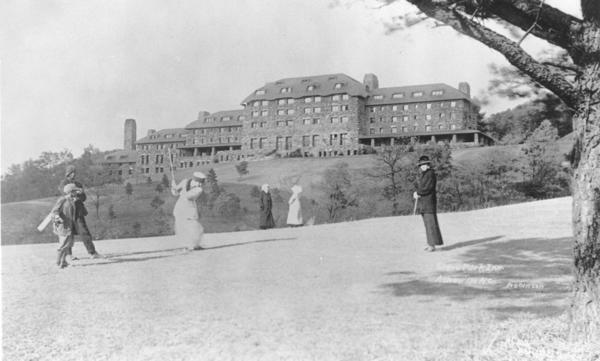 Grove Park, a tranquil inn located in Asheville, N.C., opened in 1913 and hosted well-known guests who came to the mountain town for rest and relaxation. F. Scott Fitzgerald stayed there in the summers of 1935 and 1936. His wife Zelda lived across the valley at Highland Hospital, a psychiatric facility. Fitzgerald spent two bumpy summers in Asheville, at the Grove Park Inn. A massive shelter of craggy granite stones, turning 100 years old this year, the Grove Park has rocking chairs on the terrace, huge fireplaces and a history of well-known visitors who came there for the clean mountain air, and "rest, relaxation and respite." Hotel historian Tracey Johnston-Crum strolls past framed photos of presidents, potentates and artists who have been guests — Margaret Mitchell, Alex Haley, Harry Houdini and Bela Bartok, to name a few. Fitzgerald came in the summers of 1935 and 1936; he'd had tuberculosis and needed to rest. At the inn, he rented two very simple rooms: one for sleeping, one for writing. Visitors today can see replicas of the dark wooden arts and crafts furniture and tan draperies that were there in Fitzgerald's day. English professor Brian Railsback says the windows in Fitzgerald's rooms had opportunistic views. "He came to the Grove Park Inn and chose these rooms so that he could overlook the main entrance," Railsback explains. "He could see the cars that were pulling up and he could see if there were any interesting women who might appear to be single and what were they wearing." Railsback, who is dean of the Honors College at Western Carolina University, says Fitzgerald was at a low point. He was drinking 50 ponies of beer a day — the "beer cure" — in an attempt to wean himself off gin. His writing, 10 years after The Great Gatsby, had gone flat. He was churning out hack stories for magazines, trying to pay off debts and the bills for his wife Zelda's hospitalization in a psychiatric facility. Few magazines were interested. Fitzgerald thought Grove Park Inn might help. "This was a place where he hoped that he would be restored, find discipline and then maybe find subject matter," Railsback says. "What a wonderful place to find interesting subject matter ... Wealthy people going in and out." But it didn't work. Depression readers little cared about the doings of the rich. Swathed in an alcoholic haze, Fitzgerald turned 40 at Grove Park, broke his shoulder in a bad dive, slipped in the bathroom and was found on the floor the next morning. Hoping to elevate his reputation, he let a New York Post reporter pay a visit. The newspaperman portrayed him as a lost soul of the Jazz Age, Railsback says. He was depicted as a "very broken man, who's physically feeble and mentally very pathetic and reaching to the highboy to have a drink — with a nurse on hand to watch him constantly because he had fired off a gun here in the hotel that same summer in '36." It was likely not a suicide attempt — though that was the rumor — but Fitzgerald did consider suicide after that newspaper story came out. "That was probably the darkest time of his life," Railsback says. Meanwhile, just across the valley, the once beautiful, brilliant Zelda Fitzgerald wrestled with her own demons at Asheville's Highland Hospital. Her husband rarely visited the psychiatric facility. "They both realized that they were very upsetting to each other and it was very difficult for them — when they were both fragile — to be together for any length of time," Railsback says. That Golden 1920s couple, the darlings of the Jazz Age, trapped now by their frailties. Eventually, in 1937, Fitzgerald went West, hoping to write for the movies. His wife drifted in and out of Highland Hospital for 12 years — where wealthy and often well-known patients came for expensive treatment. "It was nice and it was good quality. They spent a lot of time on the staff and the nursing," says Kitty Hancock, a psychiatric nurse at Highland from 1982 to 1993, the year it closed. 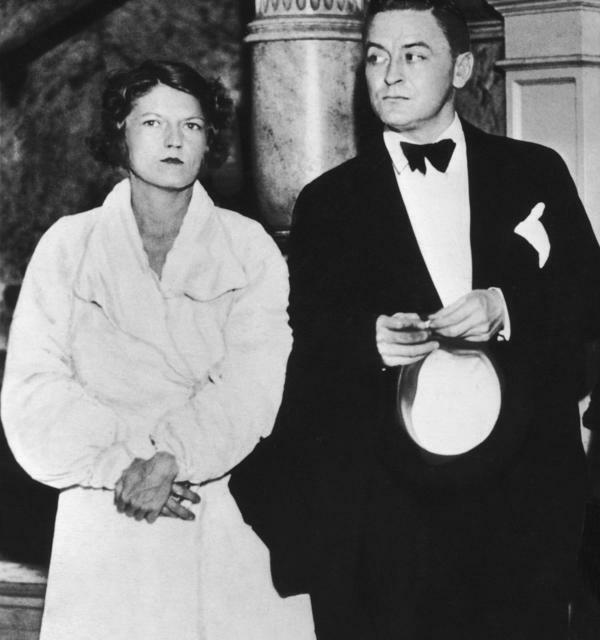 It was long after Zelda Fitzgerald's day, but Hancock says Zelda was often on the minds of staff: "We all talked about her. Everybody loved the Zelda stories." They were sad stories about the onetime Southern belle and her illness. "She was a chronic schizophrenic — that's what we always understood," says Hancock. "So that would be hard — that she really wasn't going to get better." Dr. Steven Buie was the last medical director of Highland Hospital. From what he's read about Zelda, he thinks bipolar disorder might be a more likely diagnosis than schizophrenia. "She had periods of depression and then she would have periods of high energy and creativity," he says. Traditionally, in those days before psychotropic drugs, patients with chronic mental illness were shackled or put in straitjackets. The treatment philosophy at Highland was different. The idea was, "if you provided people with purposeful activities, good diet, exercise, fresh air and clean water ... that would be helpful for them," Buie says. Zelda responded as well as she could to that treatment. Then, on the night of March 10, 1948, fire tore through the wooden building where she was hospitalized. There were rumors: that patients were sedated and locked in their rooms, that the fire was set by a vengeful nurse. The building was destroyed. Zelda Sayre Fitzgerald and eight others died. A lush, grassy field marks the spot where the building once stood, surrounded by large oak trees. "Nothing was ever built on that site again as a commemoration of what had happened," Buie says. Zelda Fitzgerald outlived her husband by eight years. F. Scott Fitzgerald died in 1940 in Hollywood, where he'd begun pulling himself together, drinking less and writing The Last Tycoon — an unfinished masterpiece. Asheville, N.C., was an interlude in their brief, unquiet lives. The mountain town of Asheville, N.C., is known for at least two important native sons. Writer Thomas Wolfe, whose 1929 novel "Look Homeward, Angel" eviscerated some locals. INSKEEP: And Charles Frazier, whose 1997 Civil War novel, "Cold Mountain," is set in the nearby hills. MONTAGNE: NPR special correspondent Susan Stamberg went to Asheville recently and discovered a little-known story of another writer, F. Scott Fitzgerald, who along with his wife, Zelda, had devastating connections to the town. 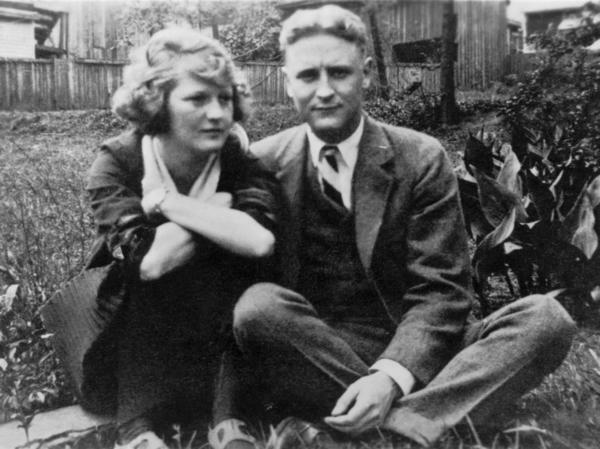 SUSAN STAMBERG, BYLINE: F. Scott Fitzgerald spent two bumpy summers in Asheville at the Grove Park Inn. STAMBERG: A massive shelter of craggy, granite stones - 100 years old this year - the Grove Park has rocking chairs on the terrace, huge fireplaces, and a history of visitors who came there for the clean mountain air and the three R's. TRACEY JOHNSTON-CRUM: Rest, relaxation and respite. STAMBERG: Hotel historian Tracey Johnston-Crum strolls past framed photos of presidents, potentates and artists who have been guests. JOHNSTON-CRUM: Margaret Mitchell's been here. Alex Haley has been here. Harry Houdini, Bela Bartok. STAMBERG: And in the summers of 1935 and 1936, F. Scott Fitzgerald. He'd had tuberculosis, which flared up; and he needed to rest. JOHNSTON-CRUM: The F. Scott Fitzgerald Suite, rooms 441 and 443. STAMBERG: Very simple bedrooms - one for sleeping, one for writing; dark, wooden arts and crafts furniture, tan fabrics; windows with an opportunistic view. BRIAN RAILSBACK: He came to the Grove Park Inn and chose these rooms so that he could overlook the main entrance. And he could see the cars that were pulling up, and he could see if there were any interesting women who might appear to be single, and what were they wearing. STAMBERG: English professor Brian Railsback is dean of the Honors College at Western Carolina University. He says Fitzgerald was at a low point, drinking 50 ponies of beer a day - the beer cure, it was called - to wean himself off gin. His writing, 10 years after "The Great Gatsby," had gone flat. He was churning out hack stories for magazines, trying to pay off debts and the bills for his wife Zelda's hospitalization in a psychiatric facility. Few magazines were interested. Fitzgerald thought Grove Park Inn might help. RAILSBACK: This was a place where he hoped that he would be restored, find discipline, and then maybe find subject matter. What a wonderful place to find interesting subject matter that especially to him, would be interesting - wealthy people going in and out. STAMBERG: It didn't work. Depression readers little cared about the doings of the rich. Swathed in an alcoholic haze, Fitzgerald turned 40 at Grove Park, broke his shoulder in a bad dive, slipped in the bathroom, was found on the floor the next morning. Hoping to elevate his reputation, he let a New York Post reporter pay a visit. The newspaperman portrayed him as a lost soul of the Jazz Age. RAILSBACK: He was now this very broken man who's physically feeble and mentally very pathetic, and reaching to the highboy to have a drink - with a nurse on hand to watch him constantly because he had fired off a gun here in the hotel that same summer, in '36. STAMBERG: Likely not a suicide attempt, though that was the rumor; but he did consider suicide after that newspaper story came out. RAILSBACK: That was probably the darkest time of his life. STAMBERG: Meanwhile, just across the valley, the once-beautiful, brilliant Zelda Fitzgerald wrestled with her own demons at Asheville's Highland Hospital, a nearby psychiatric facility. Brian Railsback says her husband rarely visited. RAILSBACK: Because they both realized that they were very upsetting to each other. And it was very difficult for them, when they were both fragile, to be together for any length of time. STAMBERG: That golden 1920s couple, the darlings of the Jazz Age, trapped now by their frailties. Eventually, in 1937, Scott went west, hoping to write for the movies. Zelda drifted in and out of Highland Hospital for 12 years. STAMBERG: Driving to what was the Highland Campus, where wealthy and often well-known patients came for expensive treatment. HANCOCK: It was nice, and it was good quality. They spent a lot of time on the staff and the nursing. STAMBERG: Kitty Hancock was a psychiatric nurse at Highland from 1982 to 1993 - the year it closed, long after Zelda Fitzgerald's day. What do you know about her history here? HANCOCK: Not that much. We all talked about her. Everybody loved the Zelda stories. STAMBERG: Sad stories about the onetime Southern belle, her illness. HANCOCK: That she was a chronic schizophrenic. That's what we always understood. And so that would be hard, that she really wasn't going to get better. DR. STEVEN BUIE: What I've read about her, it sounds to me like bipolar disorder would have been a more likely diagnosis. STAMBERG: Dr. Steven Buie was the last medical director at Highland Hospital. BUIE: Because she had her periods of depression, then she would have periods of high energy and creativity. STAMBERG: Traditionally, in those days before psychotropic drugs, patients with chronic mental illness were shackled or put in straitjackets. The treatment philosophy at Highland was different. BUIE: If you provided people with purposeful activities, good diet, exercise, fresh air and clean water, that that would be helpful for them. STAMBERG: Zelda responded as well as she could to that treatment. Then, on the night of March 10th, 1948, fire tore through the wooden building where she was hospitalized. There were rumors that patients were sedated and locked in their rooms, that the fire was set by a vengeful nurse. The building was destroyed. Zelda Sayre Fitzgerald and eight others died. BUIE: Right here, in this grove of trees, is where the building was. So just where those chairs are was the footprint of the building. STAMBERG: It's a lush, grassy field now, surrounded by large oak trees. BUIE: After that, nothing was ever built on that site again, as a commemoration of what had happened. STAMBERG: Zelda Fitzgerald outlived her husband by eight years. F. Scott Fitzgerald died in 1940 in Hollywood, where he'd begun pulling himself together - drinking less and writing "The Last Tycoon," an unfinished masterpiece. Asheville, N.C., was an interlude in their brief, unquiet lives. MONTAGNE: F. Scott Fitzgerald is said to have dictated a list of essential books during his time in Asheville. "Sanctuary," by William Faulkner, is on it and also, Henrik Ibsen's "A Doll's House."